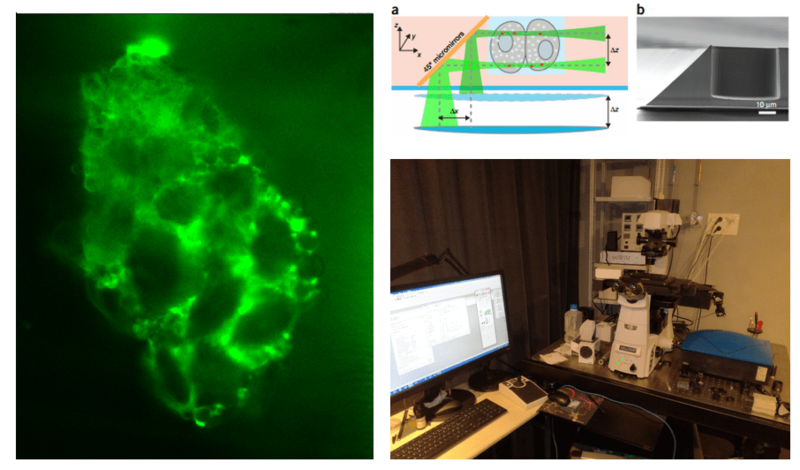 Imaging inner cells in a 3D spheroïd requires a well adapted microscopy technology. HCS Pharma is now equipped with MicroXLS Confocal from Molecular Devices to perform the best images using an automated spinning disk microscope. We also pursue our development using brand new microscopy technologies to have an overview of the different available possibilities. Thanks to Dr Sibarata and Dr Galland from the Interdisciplinary Institute for Neuroscience located in Bordeaux, France, and Mr Clouvel from Imagin Optics, who gave us the opportunity to use the SPIM microscope. Dr Savary, our partner in Innovcell 3D project, joined us with hepatocyte spheroïds prepared for imagery. Images obtained showed us a deep imaging of our spheroïds, with the greatest contrast at the level of the first cell layers. We will go on with innovative sample preparations to allow a deeper observation of the spheroids.